Fleetwoods Circumnavigation » Blog Archive » Saturday July 12th Third consolation (troost) prize for Holland in the World Cup. Muito Obrigado Brezil. Até logo! Saturday July 12th Third consolation (troost) prize for Holland in the World Cup. Muito Obrigado Brezil. Até logo! So, now all we still need to do is see the Sunday’s final game of Germany defeating Argentina and then we can go back to our normal routine. But it has been an exciting spectacle of changing fortunes. I wonder if Brazil will ever offer to host the games again… In the end the best team won. The Germans are at their very best. But I expect that in 2018 the USA will move up higher again. Last night I watched a free movie put on in one of the parks here in Gig Harbor.”The Help”, I had forgotten that I had seen it years ago, on an airplane. I watch very few movies and this must be the first one I have ever seen twice. But the advantage is, that since you already know the plot, that you pay more attention to the acting. And several of the players, in particular the main character, the black maid, Viola Davis, who won an Oscar, were awesome. A very moving story. Hard to imagine these abuses took place in our life time. But it also showed the good sides of some of the southern white folks. I am showing a few pictures of wood boat building craftmanship right here in the marina I live. Last night Jeff and Julie Stang stopped by in this gorgeous Cosine Wherry. Made in strip plank 1/4″ thick W.R. and Alaska Yellow Cedar with some Ash and Purple Heart for accent. 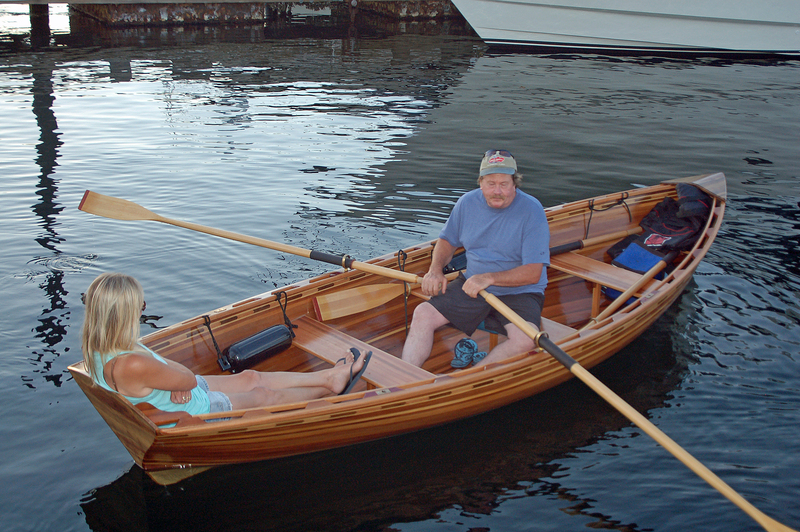 The oars are made from Sitka Spruce with Purple Heart tips. Jeff is a local boat builde and fine woodworker here i the harbor. 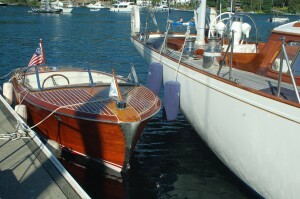 The other picture is of a 1952 ChrisCraft runabout owned by Dan McDonough, parked next to his 55? 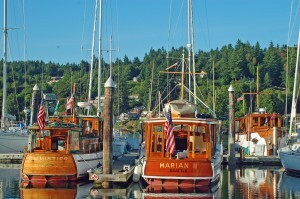 foot Sparkman & Stephens designed yawl “Weatherly”; also from the fifties. 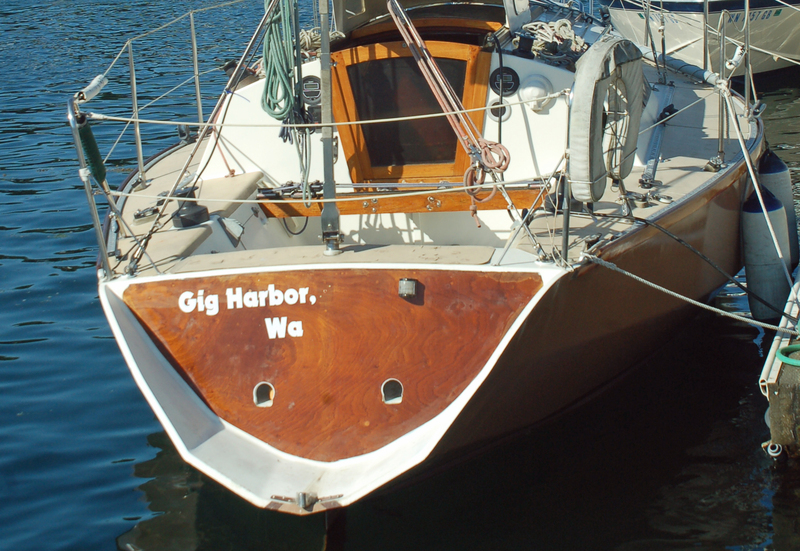 The gorgeous varnish touch up on “Weatherly” is the work of my dock neighbor Ira Specter. When I grow up I want to be as good a re-finisher as Ira. The last picture is of the end result of painting the cockpit bulkhead on “Fleetwood” and re-varnishing the companion way trim and roof. And the replacement of the of the transom deck where the plywood had rotted out around the rudder. Slowly catching up with the years of neglect but fortunately most of the maintenance is cosmetic. I also enlarged the scupper holes, to be able to drain the cockpit faster when a good wave rolls into the cockpit. 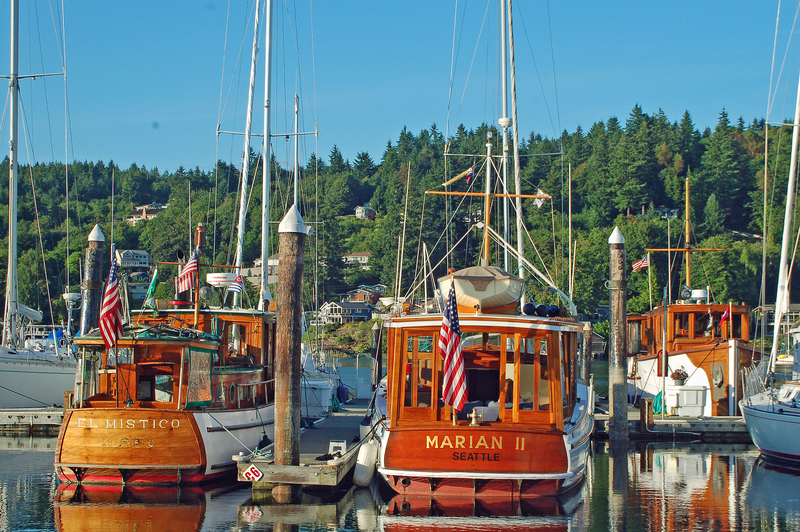 The “Marian II” was built in 1928 and the “El Mistico” 45 ft in 1927, the latter at Ballard Marine, the one on far right is the third of the visiting bridge deck cruisers, a Canadian owner.